Plunging into the unknown depths of the ocean and kneeling on the ocean bed amidst a shiver of sharks swimming around amicably, Cristina Zenato gently pats Foggy Eye — a shark she has known for long. As it nuzzles close to her body, she inserts her other hand into its mouth. Gently, Zenato pulls out a hook that was lodged inside Foggy Eye’s mouth — a hook it picked up accidentally from a fishing line in the sea. “Sharks pick up hooks on the way regardless if it is for them or for other fish,” says Zenato, an expert on sharks with 25 years of association with them. Bothered with the lines lodged inside their mouth, they desperately try to scrape on the sand to get rid of it. Slowly their jaws get infected which can then spread to the rest of the body. Removing hooks from a shark’s mouth is not an easy task, admits Zenato who has earned a place in the Women Divers Hall of Fame. The problem is that although the shark wants the hook to be removed and keeps coming back to Zenato, the moment it feels pain, its natural instinct is to pull away from her. We need to move away from this need to dominate everything in this world. We are actually invasive and destructive. Some hooks are tough to extricate because of their shape and the way it gets stuck in the shark’s jaw line. “They curl deep into the jaw and the barb remains stuck in the thick skin,” explains Zenato, who is also known for her cave explorations. Sometimes, it takes several attempts over many days to remove a hook. What leaves Zenato astounded is that despite the pain, the sharks keep returning to her and want the hooks removed. She talks about Scrunchy who stayed in her arms for a long time while she wrestled with a tough hook inside his mouth. Born in Italy, Zenato grew up in Africa. She inherited her love for the sea from her parents and has fond memories of swimming in the sea with her dad or mum. Her father, who worked in the military, often shared stories of his diving expedition. “His stories spoke of a live sea, full of creatures and amazing encounters. There were no dangerous monsters but just beauty and discovery and fun,” she says. Initially, Zenato had a career in languages — she speaks Italian, English, German, French and Spanish — and in hotel management, but her life changed when she first set her eyes on the sharks in the Bahamas. 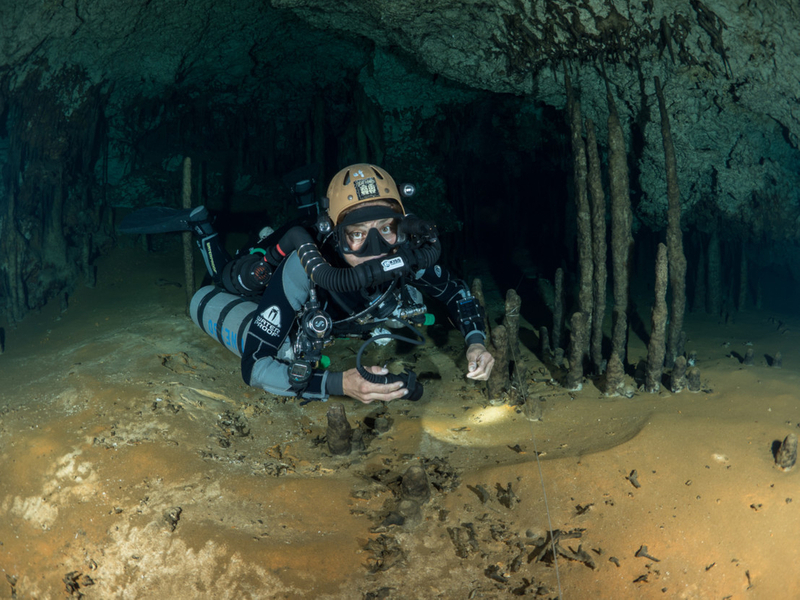 Moving to the island and starting as a scuba instructor, she found her life’s calling in the Bahamas with Ben Rose, UNEXCO Guide and Marine Expert, as a mentor. Twenty five years later, Zenato continues to live in the Bahamas. “Fishing sharks is now forbidden in the Bahamas as this country is a shark sanctuary, a battle we won back in 2011,” reveals Zenato who is part of the Bahamas 20/20 project — a mission to protect more marine life. While mainstream films have depicted sharks as dangerous, cold blooded animals out to attack humans, Zenato’s videos posted online reveal a different reality. Some of them show Zenato standing on the ocean bed with a food container while the sharks swim and swarm around her but never attempt to bite her, looking for the fish that she will soon give them. “Isn’t that fascinating? This is something we could not do with another animal. Would we have a chance with animals in the Savannah? Our fear stems out of our ignorance,” she says. Knowledge about sharks and their role in the ocean can only transform our fear into fascination for them. There are more than 500 species of sharks — the smallest one can fit into the palm of the hand and the largest one is roughly the size of a mini bus and feeds on plankton. Zenato wears a specially designed chain mail suit manufactured by Neptunic Industries (Florida) while working in close proximity with sharks but not while scuba diving or swimming. Depending on the size of the suit, it can weigh nearly 10 kg. Calling it “the barrier that allows me to drop barriers between me and the sharks, it is akin to a seat belt to be of use in an emergency,” she says. Zenato’s suit is shaped to her body and moves like liquid metal. It does not stretch and is flexible. It prevents accidental bites when a shark misses the fish and gets her hand by mistake. And, when it bites on the suit, the texture makes it realise that this is not something soft and edible. 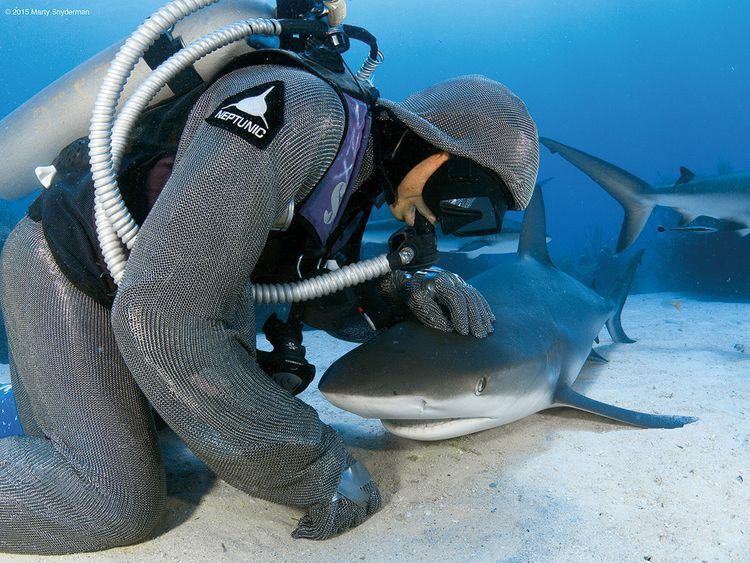 The suit also prevents the tip of the shark’s tooth from getting through. Nothing gives Zenato more joy than being in the company of her babies as she calls them — Grandma with her light colour, Foggy Eye with a grey eye, 11 year-old Stumpy and Crock, to mention a few. Being with them is like being at home — a safe comfortable environment where she finds peace. Surprisingly, most of them are females except for one male shark, Mad Eye, who after many years started to relax and enjoy her touch. However, he has been gone for the last two years. Zenato explains that her relationship with the sharks has grown over the last 24 years through constant interaction and understanding of each other. Have there been any unfortunate incidents? Counting her own self-doubt among the hurdles, she says that we are our worst enemies. Not to forget that she had to work harder to find her place in a man’s world. Through her recently launched non-profit organisation — pownonprofit.org — Zenato’s mission is to change people’s attitude towards the aquatic world through exploration, education and conservation. She is also expanding her educational outreach in the form of direct presentations and Skype or Google Hangouts. Future plans include a shark tagging project to establish where sharks go to reproduce and leave their young, so that the areas can be protected. She is also working on two books — one on sharks and the second about her love for water. Mythily Ramachandran is a writer based in Chennai, India.